Ryu of Anryugyo is composed of two more elemental characters. On the bottom is a horizontal line indicating the earth. Above the bottom line is a person standing. It means to stand or to stand up for something. In this case, peace. Gyo is composed of two primitive characters. On the left is the left foot. On the right is the right foot. It means repetition (like one foot after the other in walking) or practice. Gyo is the same gyo of Gongyo (assiduous practice). Anryugyo is Peace Standing (Happiness) Action (Skt. Supratichthitacharita). 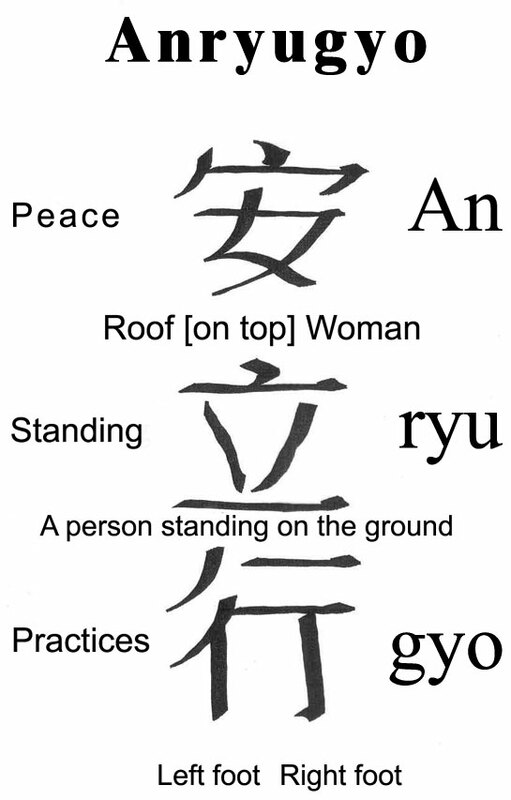 "Anryu" stands for (leads in the direction of) peace and happiness. He/she corresponds to the element “Earth” and has all the powers of earth (steadfast, stubborn, nourishing, peace abiding).